Under the direction of Mr. Lawrence C. Anspach, American Cemetery/Mortuary Consultants, Inc. (ACMC) provides consulting, valuation, and brokerage services to cemeteries and funeral homes. For 45 years, Mr. Anspach has visited cemeteries and funeral homes throughout the United States and abroad, keeping in touch with changes in value, improvements, trends, and the patterns of the death care business. Mr. Anspach has assumed a very active role in national and regional organizations within the death care industry. 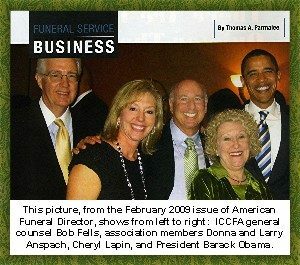 He served two terms on the Board of Directors of the American Cemetery Association (ICCFA), an organization comprised of leading cemeteries and funeral homes throughout the United States. He also served on the Board of Directors of the Pre-Arrangement Association, another large national association. Mr. Anspach is a past President of the Illinois Cemetery Association, past Secretary-Treasurer of the Cemeteries Association of Greater Chicago, and a member of the International Cemetery and Funeral Association and state and regional associations in the cemetery and funeral home field of service. Throughout his career, he has been in constant contact with cemetery and funeral home properties affiliated with these organizations, as well as other prominent cemeteries and funeral homes. From 1973 to 1986, Mr. Anspach served as Executive Vice President and Chief Operating Officer, as well as owner, of Cedar Park Cemetery and Funeral Home in Chicago, Illinois. In 1997, Mr. Anspach created Charon Holdings Corp. to acquire 18 funeral homes in Wisconsin that were packaged as a spin-off from one of the industry’s public companies. As Charon’s President and 50% shareholder, he directed a major upgrading of operations and subsequent sale of the business. Mr. Anspach is a Certified Cemetery Executive (CCE). As President of ACMC he has provided advice and services to the leading cemeteries and funeral homes of the United States. Mr. Anspach has rendered valuation services to clients throughout the country and his advice is frequently sought on cases of land condemnation, tax appraisal, business valuations, etc. ACMC also brokers the sales of cemeteries and funeral homes, and is the listing agency for many buyers and sellers of cemeteries and funeral homes. Prior to accepting listings, Mr. Anspach has frequently been called upon to appraise the potential sale value of the properties. Cemeteries served by ACMC include traditional, religious, municipal, memorial park, garden, and fraternal cemeteries. Profit and non-profit cemeteries and funeral homes, large metropolitan cemeteries, as well as small, rural cemeteries are also among ACMC’s clientele. Rick Paskin has over 40 years of broad-based business experience as a management consultant, Certified Public Accountant and entrepreneur. Rick’s work in the funeral industry includes serving in a management capacity for large funeral home and cemetery operations, performing numerous cemetery and funeral home appraisals, and brokering the sale of businesses. Rick Paskin is the co-founder and Managing Director of Funeralwise.com. Rick has directed the development of Funeralwise.com into a leading resource for funeral information and planning tools on the web. Thousands of consumers visit Funeralwise.com each day for helpful information on funeral customs, etiquette, and grief. The site’s powerful online funeral planner enables users to plan all aspects of a funeral. Prior to his experience in the funeral industry, Rick was a founding partner of J Marc Group, Chicago, IL, a firm that specialized in developing, producing and distributing television and video programming. J Marc Group was widely recognized for its acclaimed crime prevention programs including: the Street Smarts series of national television specials on PBS; and Tough Target, a nationally syndicated weekly television series. Rick began his career as a certified public accountant. Later, as a management consultant, he directed numerous complex assignments involving strategic planning, organization, marketing, financial analysis, operations improvement, and information systems for a wide variety of clientele. William is an attorney who specializes in pensions and corporate law. He has drafted stock and asset purchase agreements, for buyers and sellers in the death care industry.